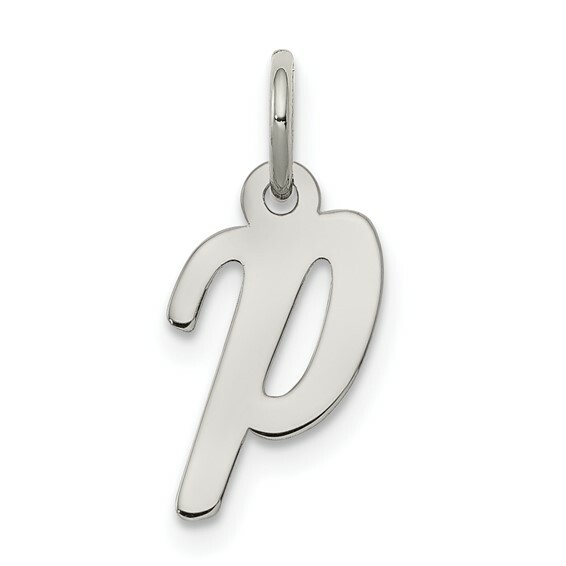 Small script initial P charm is made of sterling silver. Measures 3/8 inch tall. Fits up to a 2.5mm wide chain. Weight: 0.3 grams. I purchased identical cross necklaces for my twin Goddaughters for their confirmation. I purchased an A and a D for their first names to attach to the back clasp so they will know how to identify their own necklace. It turned out so nice, I decided to purchase a D, G, and P - the initials of my granddaughter in order to put on her cross necklace as well. Thank you, Joy Jewelers for providing this lovely and economical way to personalize jewelry for three very special young ladies.